Of course, the usual answer has to be no, because Italy is far too far south to see the northern lights. However, thanks to advances in camera technology in recent years, the answer this year was yes! The aurora borealis was streamed live from Lapland at Rome’s Auditorium Parco della Musica each evening in February and March this year. 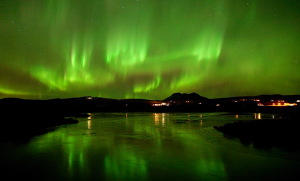 The idea of a live display of the mystical aurora dancing in the northern skies, accompanied by classical music and dance may seem like an obvious one to capitalise on, but it is only recently that it has become possible – thanks to advances in camera technology. Steve Collins is a man who knows a thing or two about streaming the aurora. After a rainy weekend in Iceland, waking up every hour in the hope of a break in the clouds, which some of the aurora hunters who follow our blog may be familiar with, he started the Live Aurora Network to capture the lights on camera and stream them in real time. The streams may allow scientists to better study space weather, and help guides find optimum viewing spots. In its infancy, the Network went through a series of recording options, before hitting on the recently developed Sony A7SII camera, which is designed for low light. A breakthrough in camera processing power, allowing light captured to be scaled up with minimal loss of detail, means you can now get a well-lit photo but can still take rapid enough images to capture fluid movement. This means that more people than ever before can experience moving aurorae. Of course, watching a film of the aurora is not the same as seeing it live, no matter how good the technology. But something of the mysticism is always captured. And the more real, the more magical. Whilst purists may say it should only be seen by those who make the trip, creating new ways to experience its majesty and bringing that spiritual feeling to more people – even in a diluted form – can only be a good thing.